When it comes to juicing, you can choose between a centrifugal or masticating juicer. It is easier to search and find one in the latter category since it is not as clouded as the former category. Another popular masticating juicer is the Hurom Elite HH-SBB11. By just looking at the ads, you would instantly think it is the best juicer on the planet. But how does it fair against other juicers? Let’s look at in detail. 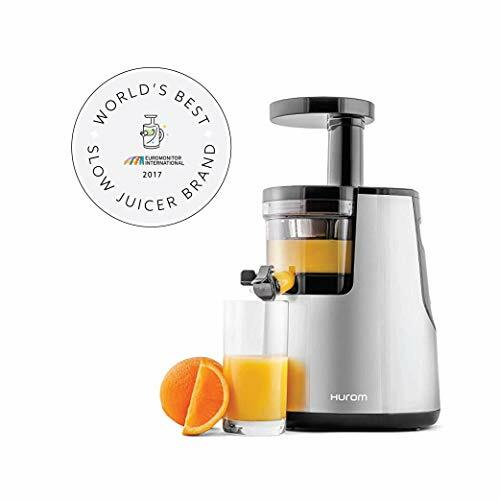 The Hurom Elite HH-SBB11 is a masticating juicer with a 150-watt motor that rotates at 43 RPM. Compared with other masticating juicers like the Omega J8006, this is a little slower. Hurom claims the juicer has the ability to extract 35% more juice, and you will indeed notice that the yield is high. With its twin-winged auger, the pulp coming out is very dry, so you will have more to drink. The auto pulp ejection feature is supposed to release pulp when it cannot extract any more juice from it. This combined with the slow squeezing technology makes the Hurom Elite HH-SBB11 one of the most efficient juicers on the market. Since it runs so slowly, the juicer does not make too much noise. And because of the slow speed, the unit does not produce a lot of heat. This is important as too much heat can damage vitamins and other enzymes in the juice. As expected, this juicer excels when it comes to vegetables. If you are planning on juicing lots of vegies, then this is a machine worth taking a look at. Surprisingly, the juice has more form than you would expect from a masticating juicer. However, since this rotates at such a slow speed, it will take time to finish making even a glass of juice. In addition, the small feed chute is a problem. It necessitates the need to precut your food thereby increasing preparation time. This juicer is certainly not ideal for busy people who usually do not have time for juicing. Since preferences differ, the juicer comes with two strainers (for a fine or course drink). Despite this, the juice still has some pulp. Overall, this is a great juicer in that it gives a high yield and it is easy to use. If you have ever used a cheap juicer before, you know how hard cleaning can be. But for the Hurom Elite HH-SBB11, cleaning is easy as drinking your juice. The brilliant design of the machine makes dissembling and assembling really easy and fun. There are only 5 parts that need cleaning. The inclusion of two cleaning brushes is again a nice gesture. Like many other juicers, the Hurom has its own safety features. If any of the parts is not in place, the machine will not turn on. This is important as sometimes assembling can go wrong which could lead to undesirable results. In addition, the manual states that the juicer should not run for more than 30 minutes continuously. the juicer is fairly good looking. You will not be embarrassed to have your friends over to your kitchen. In conclusion, this is a fairly great juicer from Hurom. It combines great features and it is good at extracting juice. It would make a nice machine for those who want to juice green vegetables. But if you know you do not have the time, you should stay away as it will likely sit in storage.